It is the habit of every finance minister to call his budget a development budget. This is despite all budgets since around 1956 having allocated a bulk of resources – about 75% – for consumption and not for capital formation. Even then, the monies spent on consumption had been on such unproductive expenses like expanding the public sector, bailing out loss-making public enterprises or offering unaffordable subsidies generally to people rather than extending them to deserving target groups. The private sector chambers are not better in this game. They are also used to joining the chorus with the Finance Minister and labelling it a development budget by looking at only the selective proposals favourable to them. 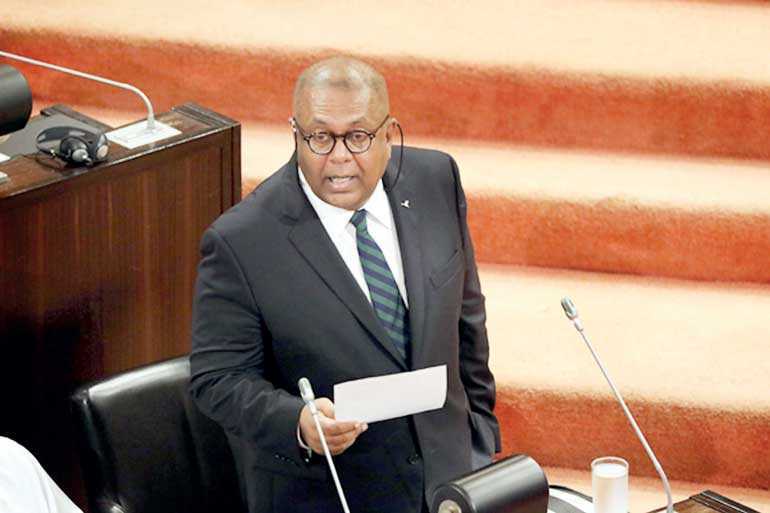 Minister Mangala Samaraweera should see to it that his truncated Budget covering only the balance eight-month period left over from the vote account does not fall into this pitfall. A budget is a development budget when it has taken a medium to long term view of the economy and aligned its expenses, goals and priorities to meet the aspirations of the people. It has been the avowed goal of both Mahinda Rajapaksa and Ranil Wickremesinghe administrations to elevate Sri Lanka to the status of a rich country within a generation. A generation in economic terms normally covers about 25 years. Thus, Rajapaksa expected to make Sri Lanka a developed country by 2035. Wickremesinghe, who took over the reins of administration in 2015, sought to attain that goal by 2040. However, the budgets that have been presented by both administrations have been opposite to the attainment of this goal. They have boosted consumption by the public sector rather than allocating resources for development. The Budget 2019 is being presented at a time when Sri Lanka’s economy has been in a dire state. Its growth has been slowing down from 2013 to about 4.5% per annum on average. It had accumulated debt which required almost every penny the Government raises as revenue to pay annual interest and repay the maturing debt. The so-called development budgets had sought to resolve the debt issue by reissuing the same and thereby postponing the burden of repayment to future generations. Since the budgets also had run deficits, the new issues as well as the reissues had led to a massive accumulation of debt which Samaraweera warned would be more dangerous than a garbage dump that is like to collapse on itself. The country’s exports had been falling, the current account of the balance of payments recording deficits of high magnitudes and the rupee coming under depreciation due to depleting foreign exchange resources. The next three years appear to have painted even a worse picture as predicted by the World Bank in its recently issued Sri Lanka Economic Update 2019. Its prediction has been that growth will further slowdown to 3.1% in 2019 before it would recover to a still low growth rate. This has been confirmed by Central Bank Governor Dr. Indrajit Coomaraswamy in a recent press conference. All in all, the country’s economic growth will not exceed 3.5% during 2019-21. This would be further exacerbated by a lack of needed foreign exchange resources to defend the rupee. Hence, Budget 2019, in my view, should lay foundation to address this issue and push the economy back to a high growth path. As I have argued in my previous article in this series, it requires the country to change its production model from labour intensive to tech-intensive. That could be achieved by creating a critical pool of innovators initially and allowing the rest of the crowd to imitate them later. Without innovations, Sri Lanka cannot think of becoming a rich country. Thus, Budget 2019 should be an innovation inspiring budget. Modern economies are often called knowledge economies because they rely on knowledge for survival and sustenance. The period within which knowledge is said to have reigned the world spanned roughly for about five decades starting from the middle of the 20th century to its end. During that period, the development of knowledge creating activities, namely, education, training and learning received the highest priority in public policy making. However, with the onset of the 21st century, the order of the world has substantially changed making knowledge a necessary but not a sufficient condition for continued prosperity of nations. In the current context, knowledge still has to lay the foundation for a nation to survive, sustain and prosper. It has now been recognised that with knowledge, there should be two other conditions that have to be put in place for knowledge to deliver its intended promise. They are ‘innovation and creativity’ which are used interchangeably to denote the same requirement. Hence, modern economies are called ‘innovation economies’ or interchangeably, ‘creative economies’. It was Austrian-American economist Joseph Schumpeter who made the distinction between knowledge and application when he emphasised that inventions made by scientists and researchers should be followed by innovation by entrepreneurs. To complete the process, two other activities have to be undertaken: diffusion of that knowledge of innovation in the economic system so that there would be massive imitation of same by others. Knowledge will enable researchers to create new things called ‘inventions’. There are thousands of such inventions made by knowledgeable people every day. Unless they made commercially viable, they just remain as prototype inventions incapable of going through an assembly line of a factory. That process, says Schumpeter, is ‘innovation’ or ‘doing things differently in the realm of economic life’. According to him, innovation leading to continuous economic growth of a country is a process and it consists of four stages. The first stage in the invention is coming up with a prototype of a new product. At the time of creating these inventions, the scientist or the researcher concerned has no idea about whether they would be commercially viable. He only knows that it would change the prevailing world habits or systems. Commercial viability comes from two other factors. One is that there should be a demand for the new product in preference to what is presently available in the market. The other is that the producers should be able to produce it at a cost that would generate him a profit when he sells it at prevailing market prices. If these two conditions are not met, the prototype invention will just remain an invention only on paper. Hence, it is the entrepreneurs who convert inventions into innovations. A good example is the first Apple Macintosh Desk computer, created by Stephen Wozniak, being commercially produced by Steve Jobs. The third stage is the dissemination of knowledge which Schumpeter called ‘diffusion’. Once the knowledge become public, others will soon imitate it creating a critical pool of innovators. Thus, it is not knowledge per se that would usher prosperity to Sri Lanka. It is the conversion of knowledge into marketable goods and services through innovation, spread of the information on innovation through diffusion and imitation of such innovators that would bring a continuous high economic growth to a country. Hence, the role of the Government is to create an environment conducive for invention, innovation, diffusion and imitation. This is where Sri Lanka lags behind many nations in the world as revealed by the latest Global Innovation Index or GII published by Cornell University, INSEAD and World Intellectual Property Organisation for 2015. The index value is the combined outcome of two sub-indices, one on innovation inputs and the other on innovation outputs. The ratio of outputs to inputs depicts the innovative efficiency of a country. If a country has an innovative efficiency ratio of more than or close to one, that country has a high innovative efficiency. Sri Lanka in this case has an efficiency ratio of 0.76 needing much improvement on the innovation front. The innovation inputs consist of five broad categories, namely, institutional structure, human capital and research, infrastructure, market sophistication and business sophistication. In innovation outputs, there are two categories, namely, knowledge and technology and creativity. In all these categories, Sri Lanka’s performance as an innovative economy has been far from the desired. It also opens a wide policy corridor for the Sri Lankan Government to adopt for implementation if it is really interested in building its knowledge base and its application in business. The report has highlighted that it is the research and development that leads to technological inventions. A country should secure its technological potential by investing a sufficient amount of resources in R&D. Sri Lanka’s current R&D expenditure stands at 0.2% of its GDP in 2013 in comparison to a world average of 1.7%. In the case of highly-innovative countries like Israel, R&D expenditure has been as high as 4% of GDP. Sri Lanka is currently planning to increase its expenditure on education progressively to 6% of GDP. It is necessary that at least a half of this expenditure be incurred in the R&D area in order to gain the full technological potential that is necessary for Sri Lanka to elevate its status from a lower middle-income country to a higher middle-income country within the next decade. The report has also presented six key principles which a country has to follow in order to make it an innovative nation. Principle 1 requires a country to have an innovation policy aiming at improving innovation in all the industries. A country seeking to move from an upper middle-income country to a rich country should necessarily improve innovations in manufacturing industry in general and high-tech industry in particular. However, for a developing country like Sri Lanka where innovations are at a low level, it is necessary at first to improve innovations across the economy. Sri Lanka has been concentrating on producing simple products for the global market by using simple technology as revealed by the Economic Complexity Atlas prepared jointly by Harvard University and the Massachusetts Institute of Technology. The problem with such a production structure is that any other nation can copy it and become a competitor thereby out-beating Sri Lanka easily. Principle 2 is a further development of principle 1. It highlights that a country should support through its innovation policy, all types and phases of innovation not necessarily confining itself to high-tech industries. This is because the innovation gains in high-tech industries are negated if other sectors in the economy are lagging behind causing their inefficiencies to rub on improved sectors as well. Hence, it is a macro level efficiency improvement that is needed rather than the efficiency improvement in a given sector of the economy that leads again to the development of a dualistic economy. Principle 3 requires a country to adopt what is known as ‘disruptive innovations’ so that a country can directly get itself linked to the advanced economies in the world. This is what Joseph Schumpeter termed as ‘creative destruction’. The mistake which many countries do in introducing innovations is to go for marginal improvements in the existing industries. On one side, such marginal improvements are incapable of generating a sufficient prosperity for the nation. On the other, they also widen the technological and innovation gap between the country concerned and other competitors making it difficult for competing with them in the global markets. Principle 4 relates to making available capital goods imports, especially those products relating to information and communication technology, at an affordable price keeping such prices low. This is to enable a country to replenish its worn-out capital quickly. If it is not done, innovation processes started by the country loses its steam in midway, productivity improvements stagnate and competitiveness started by businesses starts declining. The way out for countries to do this, according to the report, is to keep tariff and trade barriers low so that advanced capital goods can be acquired to make their economic enterprises competitive with the rest of the world. This is highly pertinent if Sri Lanka plans to develop a competitive healthcare sector to attract healthcare users from the rest of the world. Principle 5 highlights the need for supporting the key innovation inputs on a wider scale. In addition to the availability of ‘best-in-class’ ICT, the other inputs such as reliable digital infrastructure, a skilled workforce and new knowledge should also be available to businesses. It is necessary to support both the production and the transfer of such key innovation inputs to businesses. For instance, if a State-owned research institution comes up with an invention, the government should have clearly laid out policy principles for private businesses to acquire such inventions having paid the due amounts to such research institutes. Principle 6 is concerned with developing a national innovation strategy and suitable organisational structures to implement such strategies. Successful innovation nations have benefited from the creation of such dedicated organisations to carry their national innovation strategies forward. If such organisations are established under the direct supervision of the head of the state, it would immensely facilitate them to attain their goals easily by coordinating with other state and private organisations. An innovation economy differs from a traditional industrial economy in several respects. First, in an industrial economy, it is natural resources, labour and capital that matter as inputs for economic activities. But an innovation economy is ruled by ‘ideas’ that are used in actual businesses that harness those inputs. Second, an industrial economy focuses on mass production for use by customers. An innovation economy too produces for consumers but gives priority to design and quality based on information and communication technology. Third, industrial economies are organised as large corporations that depend on economies of scale. Innovation economies, on the other hand, are composed of small-scale entrepreneurs who use networks and agents to do business. Fourth, the success of industrial economies is based on labour and its availability, quantity of products, low costs and ability to control organisations and markets. Innovation economies depend on talents, speed of delivery, innovation flexibility and customisation of the products for success. The knowledge-makers should also be effectively linked to business and industry. In the past, this did not matter so much because it was the inventors themselves who put their inventions into commercial production as well. But today, inventions are made at a rate and all inventors are not entrepreneurship-savvy. This makes it necessary for outsiders who are enterprising to absorb inventions and make them available in the form of goods and services to consumers. Large companies have the capacity to acquire and command over inventions without the help of an outside party. But small start-ups and entrepreneurs need the services of networks and agents to get connected to funding, inventions and markets. Such innovation facilitators are called ‘innovation brokers’ who have now become an important element in a proper innovation economy system. Surely, Budget 2019 cannot address all these issues. But it can lay foundation for future emulation.